Surgery, radiation and conventional chemotherapy stand as the hallmarks of current cancer treatment. Now the term “targeted therapy” frequently enters the conversation. The two primary types of targeted therapy include either small-molecule drugs – often taken as pills and microscopic enough to enter cells – and monoclonal antibodies – usually delivered through an IV to attach themselves to the cancer cell’s exterior. Acting on specific cells associated with cancer. Interacting with a specific target. The genes (DNA) of cancer cells make them work differently than normal cells, often replicating more quickly than typical cells. Targeted drugs interact with the cancer cells in a number of ways to stop the growth and reproduction of cells, cut off blood vessels growth or kill off specific cells. Standard chemotherapy seeks to identify rapidly reproducing cells, then eradicate them. Starve the cancer of the proteins it needs to grow. Prevent cancer cells from growing. Treatment plans often employ targeted therapy in combination with surgery, radiation or chemotherapy. This helps in a situation where cancer cells can develop a resistance to the targeted therapy. 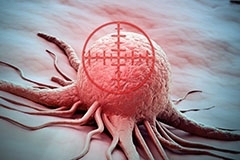 The cell target or function may rule out targeted therapy. Side effects from targeted therapy may develop in some patients. Medications often help and the side effect symptoms usually disappear after treatment ends. IS A PATIENT A CANDIDATE FOR TARGETED THERAPY? Specialists may need to take a tissue sample, also called a biopsy, to establish whether a patient’s cancer will be receptive to targeted therapy and, if so, what specific therapy will work best. If you – or someone you know – is diagnosed with cancer, ask an oncologist about targeted therapies and whether they would be appropriate. Have a cancer question? Ask a specialist.